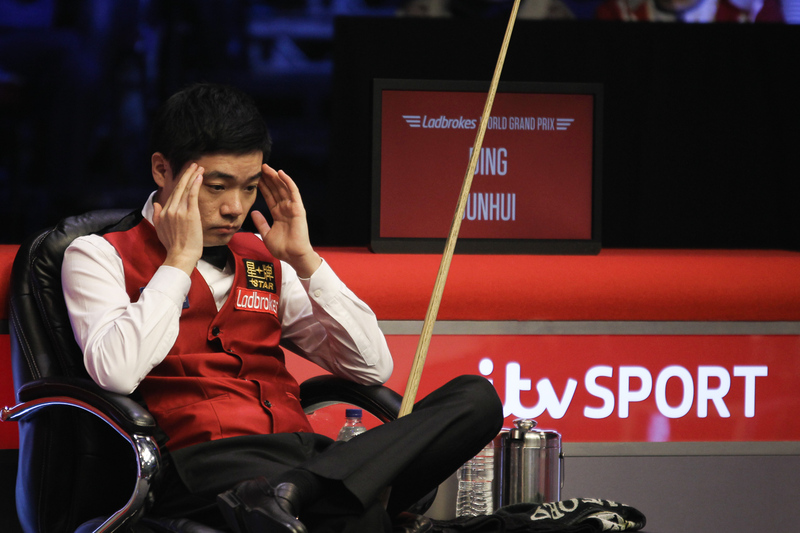 Ding Junhui came from 3-1 down to beat Thepchaiya Un-Nooh 4-3 and become the first man into the semi-finals of the Ladbrokes World Grand Prix in Llandudno. China’s Ding is now guaranteed £20,000, a significant boost to his ranking position as he looks to ensure his top 16 place ahead of the World Championship. He will face Shaun Murphy or Liang Wenbo on Saturday in his first ranking event semi-final of the season. In a high quality match, Un-Nooh won the opening frame with a break of 97 then Ding levelled with a 92. Six Red World Champion Un-Nooh made 84 and 74 to lead 3-1. Ding made 51 in frame five then Un-Nooh had a chance to clear for victory but missed a red on 34. Ding capitalised to pull one back then made a 65 in the next for 3-3. And Ding finished in style with a superb 108 in the decider, which included a clever planted red early in the break when he seemed to have run out of position. “It was very tough today,” said Ding. “I managed to stay in a good frame of mind even when I was 3-1 down. Thepchaiya played even better than he does in practice and he was winning frames in one visit. He played with a good rhythm and with confidence.